Even the most beautiful lawn can be marred by common broad leaf weeds. 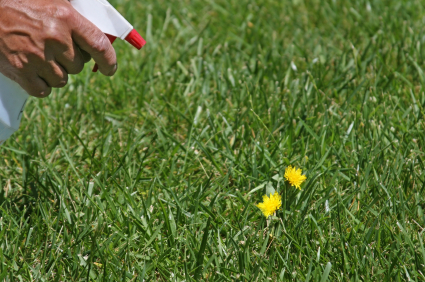 Dandelions and clover are the most predominant weeds that attack North American lawns. These weeds tend to be difficult to get rid of because they thrive on the conditions that are ideal for your lawn to thrive on as well. It is important to remove as many weeds as possible to maintain a healthy lawn. Weeds tend to soak up the nutrients and moisture that your grass needs in order to maintain its health and beauty. It is tempting to go out and purchase a strong chemical herbicide to kill off those pesky weeds. The chemical weed killers available in most stores are directly derived from the chemicals that are used by commercial farmers to protect mass quantities of fruits and vegetables from weeds. There are some definite hazards to consider when using chemical weed killers in a suburban setting. Most of the chemical herbicides can be harmful to children and pets, as well as other plants that you may not want to kill. There are natural ways to get rid of weeds without threatening the ecosystem of your home’s landscape and surrounding neighborhood. There are several natural and organic weed killers available on the market today. Most of them include formulas that are based on the natural weed killing properties of citrus or corn gluten. Using an organic commercial product is probably the easiest way to control weeds while avoiding the harmful properties of chemical herbicides. Commercial organic weed killers tend to be a little more expensive than traditional chemical options, however. If you are interested in saving money and killing weeds safely, you may want to look into mixing up your own natural solution. There are several natural elements that provide the weed killing properties you are looking for. Most of them work by increasing the acidity of the soil directly surrounding the roots of the weeds. Since the herbicides are organic, their acidity quickly dissipates into the soil or converts to nutrients once the weed’s roots have been killed. You can create your own natural herbicide by collecting together natural ingredients that have been proven to be effective in reducing the life of most of the common weeds that crop up in North American lawns. One of the most popular organic weed killers is vinegar. It can be used full strength, or you can partially dilute it in water. Full strength vinegar treatments are best for use on lawns that have hearty grasses. Dilute the mixture if your lawn is more fragile. Other weed killing ingredients include corn gluten and citrus fruits. The most important thing is to look for a natural substance that contains a high level of acid, which burns through the weed roots and kills them effectively. You may need to apply the natural ingredients more than once to completely kill off stubborn weeds. Apply the herbicide directly to the base of the weeds as well as the leaves and flowers for the best results. The more herbicide that reaches the roots of the weeds, the better your chances of eliminating them in fewer treatments. Since the herbicide is made from completely natural ingredients, there is no need to worry about harming the lawn by applying several treatments. The best time to get rid of weeds is before you plant your lawn or garden. If you have the opportunity to treat the soil before you install your lawn, you will have a much higher success rate against common weeds. Soil solarization is a technique designed to restore soil to its original state. It is best used in areas that contained weeds and grass before you cleared them to plant your lawn. First completely remove any vegetation in the area you want to plant. Use a rototiller to root up all traces of weeds and plants from the soil you intend to use. Once the area is completely cleared, cover it with a clear plastic sheet. Leave the plastic in place for a few days, during which time the sun will effectively burn off any remaining seeds that the weeds may have left behind. Once the solarization process is finished, the area will be completely weed free and you will have a fresh place to begin planting. When you say “a natural substance that is high in acid” – it makes me wonder how helpful it might be to use a pH kit to raise the level of acidity in plain water…. Also, can I use lemon juice from a bottle and mix it with vinegar?